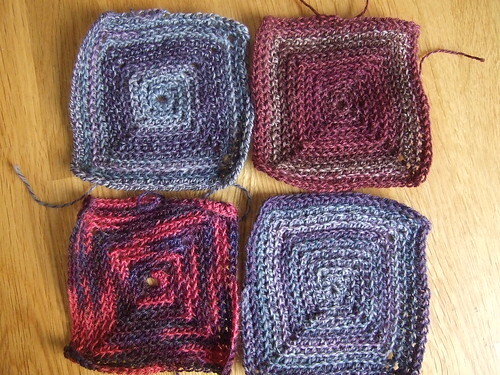 I’ve now made several more of the sock yarn squares – they are quite addictive. I think I’ve got enough oddments to make a fair sized blanket without having to knit any more socks. I’m still not sure how I’me going to join them. I was thinking of edging them all in cream or black, and them crocheting them together. I would like quite a flat seam, so I might actually end up sewing them. 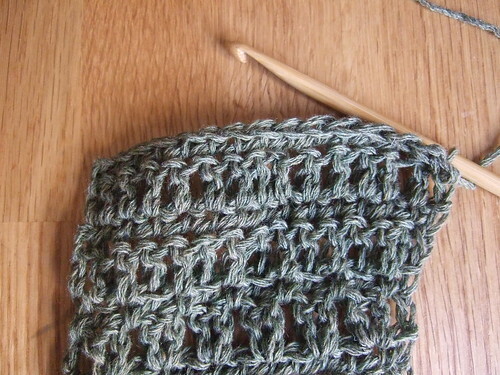 I’ve also been swatching with the olive colourmart cashmere that I bought last year. I’m going to make another round yoke cardigan. I’ve been trying out different stitch patterns, but I think I will end up sticking to the same one that I used for the original. I might try some waist shaping with this one though – we will see how it goes! Beautiful yarn! I love olive-y colors. Also, the sock squares do look addictive. I love having a project around that takes very little thinking or planning.